After nesting for 13 years above the Manteo waterfront, the Hungry Pelican now has a new home on Budleigh Street in Historic Downtown Manteo next to the famous Pioneer Theatre. Born in Manteo in 2002, its roots go back over 30 years. 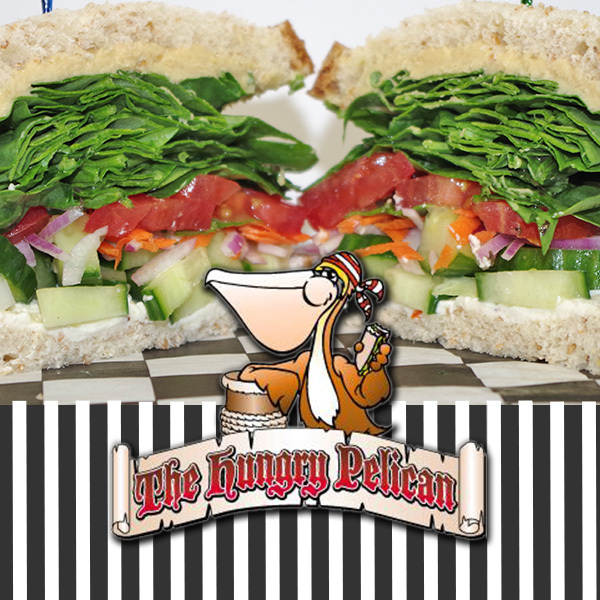 Hungry Pelican is an owner-operated deli with over 60 years of combined restaurant experience. The owners of this Downtown Manteo deli have made over 500,000 sandwiches and have satisfied people from all over the world. No expense is spared in bringing the best deli sandwiches to the Outer Banks. We exclusively use Dietz and Watson "Healthier Lifestyle" meats. These meats are low in fat, saturated fat, cholesterol, sodium and sugar. They exceed USDA guidelines for deli meats. Combine that with out cheese selection and fresh baked breads and you have the best deli sandwich possible. All of our salads are made to order using vegetables that are cut daily and every salad dressing is made from scratch. Soups, side dishes and desserts are also homemade. This truly sets Hungry Pelican apart from other restaurants. We will ensure that you have a pleasant and memorable dining experience. Last summer, 100% of first time customers said they would eat here again. This is the second year in a row!